When you think of an earth-sheltered building, what image springs to mind? For some, this could be Hobbit homes like those seen in Lord of the Rings movies. In the real world, these buildings can offer a number of advantages and unique challenges for their owners. Benefits include the protection soil can offer from extreme weather and they have very little exterior up- keep. Yet, over time the materials used to originally waterproof the facility can begin to breakdown and can be difficult and costly to repair due to tons of soil overburden installed to protect the very building. In commercial buildings, waterproofing failure can commonly cause a host of issues. 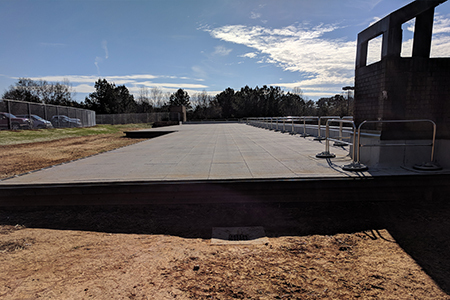 This was the case with an earth-sheltered utility building at a hospital facility in Anderson, S.C. where years of leaks led to rusting reinforcement and spalling concrete from the concrete deck. 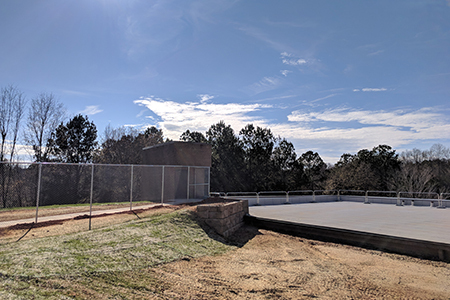 The South Carolina Department of Mental Health (SCDMH) contracted with Terracon to provide Design and Contract Administration services for the waterproofing of their earth-sheltered utility building that had been built in the 1980s. The facility provides the utilities, laundry, storage, automotive repair, grounds keeping, and facility management office space to support the nearby hospital. The utility building was built with two of the four elevations and the roof underground. The foundation level of the facility was approximately twenty-four feet below grade and the roof had approximately two feet of soil over the concrete deck. A masonry parapet wall retained the soil from being pushed over the edge to the elevations at the lower grade level. Previous attempts to fix the leaks along the top of the below ground wall met with little success. With the knowledge of the attempted repairs in mind, Terracon’s team accomplished field work and generated a design that waterproofed the entire wall down to the footing level to alleviate the persistent leaks occurring throughout the below-ground portions of the building.The design also lowered the grade to below the roof level. By doing this, Terracon’s team eliminated having saturated soil resting over horizontal surfaces such as the roof deck and at critical junctures such as at the intersection of the roof and wall. The design required that the contractor excavate down to the roof deck and the foundation. The existing waterproofing on the roof and walls was made up of a peel-and-stick asphalt membrane over the concrete and a layer of gravel to provide drainage down to the sub-grade drain. The contractor removed all existing waterproofing membranes, and existing drainage piping and exposed the concrete deck, wall, and top of the foundation. In lieu of reinstalling a “green roof” type assembly, which would look most like the pre-existing system, the Terracon team designed a more typical and economical roof system utilizing asphalt sheets over insulation. Not reintroducing the soil to the top of the roof helped provide easier access to maintenance personnel to identify leaks and perform routine maintenance. Additionally, due to the age of the structure and presence of rusting reinforcement, there was concerns with re-loading the roof deck with soil. Doing so may have caused excessive deflections or possible failure of the structure. Leaving the below ground walls exposed was not an option due to the height of the surrounding soil, so a system was designed with redundancies to help prolong the life of the waterproofing. The system utilized a liquid applied membrane over the concrete wall, and a self-healing waterproofing sheet. Drainage is accomplished by a protective drainage board to take the water within the soil to the drain that led to a nearby existing detention pond. The drainage board alleviates hydrostatic pressure from the wall and waterproofing system and also serves to protect the waterproofing from the adjacent soil. The result is a practical compromise with a building that serves the needs of the South Carolina Department of Mental Health by eliminating leaks, failed leak repair attempts, providing a roof system which is easier and more economical to maintain and simultaneously maintaining some of the advantages of below grade construction at the walls, all for the long term asset performance of this building for the state agency. Jeff Poe Jr., PE, RRO, is an engineer in the Charlotte, North Carolina office. He has experience in building enclosure testing and inspections, roofing design, above and below grade waterproofing, structural repairs, non-destructive testing, and contract administration.